Studies have proved that water improves metabolism in our body and hence it is a very critical ingredient to regulate our body weight. However, plain water tastes boring, so you can infuse it with other healthy fruits, vegetables and herbs that will add to the taste to it. Infused water is the recent craze among younger lot for reducing weight. Well, in case you are wondering about the recipes of the detox water to lose weight, then here’s the post worth reading. In today’s post, I am sharing 12 simple detox water recipes to lose weight. These detox water recipes are easy to make and it works effectively in regulating body weight. Water is the elixir of life and without it, our survival is impossible. One can live without eating food for upto 2 weeks, but cannot survive even a week without drinking water. It forms an essential part of any diet or daily exercise routine and facilitates optimum functioning of all our organs. Drinking water in adequate amounts will keep you fresh throughout the day and supply you with the needed energy. 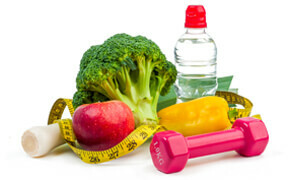 However, apart from general human well being, it serves another important purpose of promoting weight loss. Every day we are exposed to several toxins and chemicals and many of them enter our body and harm our health. Our body needs to flush them off from the system to ensure good health. This procedure is known as ‘detox’ or cleaning of your system. Water is the key ingredient that aids your liver to eliminate the harmful toxins and keep us free from disease causing germs. This method of cleansing the body stimulates metabolic rate, which in turn, burn body fat. So, you must try out my 12 favorite detox water recipes to lose weight quickly. These recipes are extremely low in fat and hence do not add to the daily calorie intake. Moreover, the other ingredients used are also very effective and hence help to double the good effects of fat reduction. Obesity or being overweight is a common problem nowadays with every alternate person complaining about his or her extra weight. Be it for the junk food intake or lack of proper exercise or certain health issues, the reasons behind weight gain is uncountable. Obesity is increasing on an alarming rate and every single day we are heading towards risking our lives more and more. 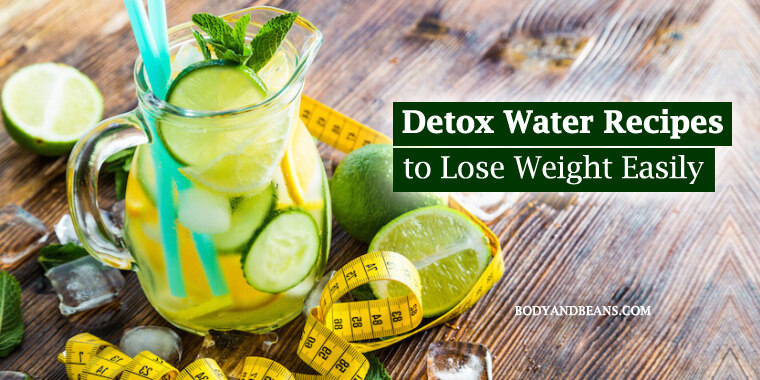 Therefore, we must desperately try methods to keep our weight at check and drinking detox water is the easiest solution to lose weight in a healthier way. However, not all know about the detox water recipes, so let me first talk about what is detox water and how it works and then start about the recipes. Water keeps us hydrated and is very critical for our well-being but fails in the taste department, so doctors recommend drinking infused water. When certain fruits, vegetables, or herbs are added to water, the flavors of those ingredients mix with it and give it a delicious taste. Here the ingredients are only infused in water rather than blending or juicing them. This makes the infused water essential for weight loss as it contains minimum calories in comparison to the fruit juices or sugary sodas. The detox water recipes flush out the harmful toxins from the body and boosts ours digestive system. In fact, these drinks not just result to overall weight loss but can also fight the most stubborn belly fat. 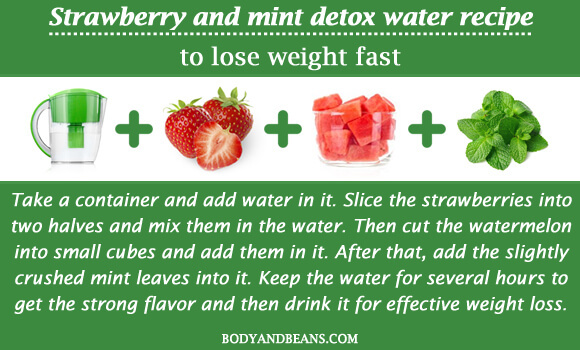 Now that you have known about the detox water, let us begin with the detox water recipes for fast and effective weight loss. There is no doubt about the potentiality of water for effective weight loss. Several studies including the study published in “The American Journal of Clinical Nutrition” are a proof of that. However, things can be made more interesting by infusing the other healthy ingredients in it, which will help you lose weight in a healthier and tastier way. Listed below are 12 top detox water recipes for fast and effective weight loss. 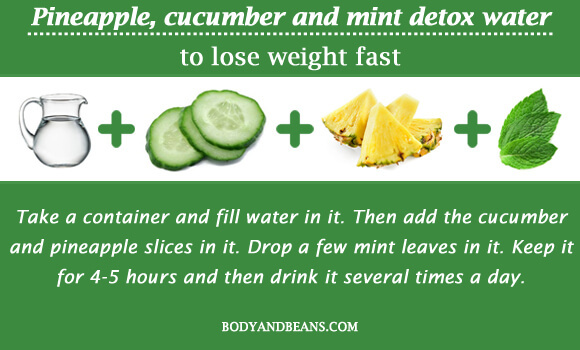 This is the most popular and probably the easiest detox water recipe for fast weight loss and you must try it. The vitamin C content in lemon is highly recommended for weight loss and has its own set of health benefits. Lemon facilitates better metabolism of our body and hence promotes weight loss. On the other hand, mint boosts the process of digestion. Its aroma activates our salivary glands and stimulates the production of the digestive enzymes that results to good digestion of the food particles. And, when you have a strong digestive system, it will automatically help to shed the extra kilos by eliminating the unhealthy and unwanted things from your body. Take medium container or glass and fill it with water. Then extract the juices out of lemon and mix it with the water. You may also simply put the lemon slices in it. After that, add the refreshing mint leaves. Let it stay for few hours and then drink it. 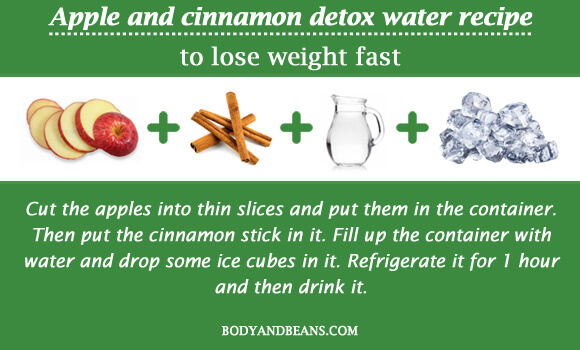 Apple and cinnamon detox water is one of my personal favourite detox water recipes for fast and effective weight loss. Apple is already a favorite fruit of many and is definitely very healthy. It contains several antioxidants and phytochemicals that can help you in effective weight loss as well as prevent the occurrence of hypertension, cancer, diabetes and cardiovascular diseases. Cinnamon is another healthy ingredient that is also very beneficial for health especially for preventing Type II diabetes. Therefore, when these healthy ingredients mix with water, it gives a recipe that flushes all the harmful chemicals and helps in fast weight loss. Here you need to cut the apples into thin slices and put them in the container. Then put the cinnamon stick in it. Fill up the container with water and drop some ice cubes in it. Refrigerate it for 1 hour and then drink it. If you are truly pissed off with your belly fat, then this is 1 detox water recipe I highly recommend. The lemon is a natural detoxifying agent that flushes all the harmful toxins from your system.The pectin fiber in it also helps to control the hunger cravings. The other ingredient watermelon contains an amino acid citrulline that cleanses the kidneys and liver of ammonia. Besides, watermelon also helps your body get rid of the excess water retained by your body. On the other hand, both ginger and mind helps to curb your appetite and put a check on your calorie take. Thus, all these ingredients when mixed together not just reduce your weight in general but also flatten your stubborn belly fat. Take a container and pour water in it. After that, put the sliced lemon, sliced watermelon, grated ginger and mint leaves in it. Leave the container nightlong and drink this the next morning. 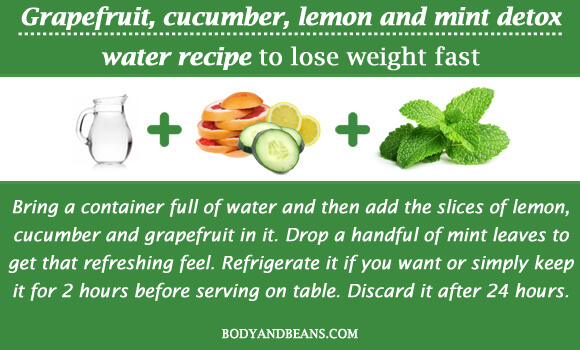 Another simple yet one of the best detox water recipes for fast and effective weight loss is the lemon and cucumber detox water recipe. You already know how effective lemon is for shedding kilos and maintaining the metabolic rate of our body but it when mixed with cucumber intensifies the good effect. Cucumber is very low in calorie and is rich in dietary fiber. It is a diuretic that aids in flushing the unhealthy toxic substances from body and boosts digestive procedures. 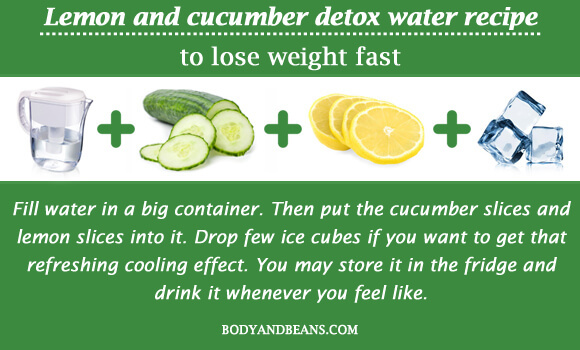 So do consume the lemon and cucumber detox water recipe and enjoy the slimming benefits. Fill water in a big container. Then put the cucumber slices and lemon slices into it. Drop few ice cubes if you want to get that refreshing cooling effect. You may store it in the fridge and drink it whenever you feel like. 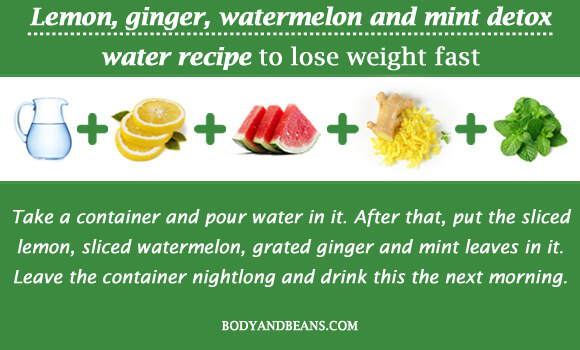 This bright looking detox water recipe is one of the healthiest when it comes to weight loss. Watermelon, besides its great taste helps in digestion and also regulates the levels of blood pressure, insulin and reduces muscle soreness. Strawberries on the other hand, are very nutritious and contain many antioxidants that cleanse your body from within and help you stay fit and healthy. The addition of the mint leaves gives a fresh aromatic feel and hence is recommended for almost every detox water recipe. To make this recipe, you have to take a container and add water in it. Slice the strawberries into two halves and mix them in the water. Then cut the watermelon into small cubes and add them in it. After that, add the slightly crushed mint leaves into it. Keep the water for several hours to get the strong flavor and then drink it for effective weight loss. This combination is quite uncommon but is an excellent remedy to promote weight loss. Mango is an amazing fruit with lot of health benefits. The nutrients in it fosters proper metabolism and thereby improves the digestive process. It is good for your brain and improves your sexual virility as well. Besides, the ginger slices curbs your appetite and inhibits you from intaking calories in excess. Ginger is also effective in getting rid of motion sickness, vomiting, menstrual cramps etc. 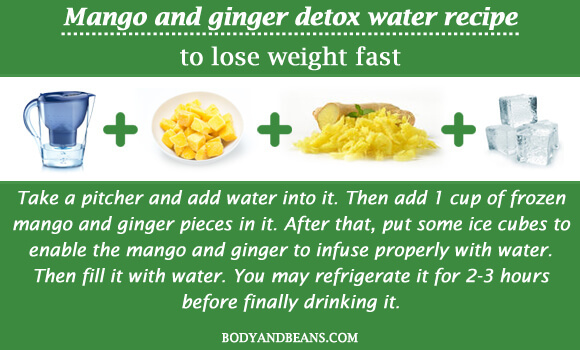 Therefore, hydrate yourself with the mango-ginger detox water recipe and shed your extra pounds in a healthy manner. Take a pitcher and add water into it. Then add 1 cup of frozen mango and ginger pieces in it. After that, put some ice cubes to enable the mango and ginger to infuse properly with water. Then fill it with water. You may refrigerate it for 2-3 hours before finally drinking it. 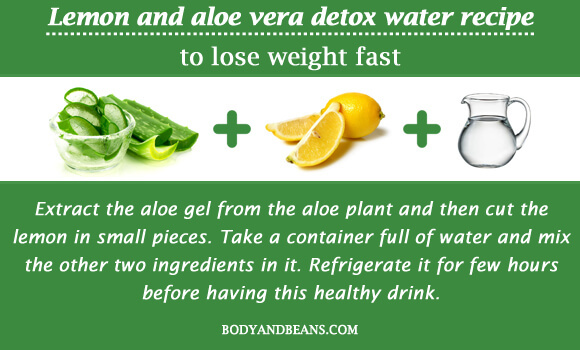 These two pretty ingredients when mixed together with water gives us one of the best detox water recipes for fast and effective weight loss. We know how important vitamin C is for our health and orange is a rich source of it. It keeps our digestive system strong and prevents other common health issues like premature aging, inflammation, and common cold and cough. The other ingredient raspberry also aids in the digestion and gives water a unique flavor and taste that is very delicious and refreshing. This combination is ideal for hot summer to cool your system and shed the extra fat. Here in this process, you need to fill the container with water. Then add the thin orange slices and slightly crushed raspberries in it. Refrigerate it for few hours and then drink it whenever you feel tired and need refreshment. Apple cider vinegar is a powerful ingredient for fostering good health with weight reduction being its one of the most effective results. It helps you get rid of the harmful chemicals and toxins, purifies and cleanses your liver and blood and helps in the smooth digestion and elimination of excreta. According to a 2009 study, the acetic content in it helps to reduce the body fat. 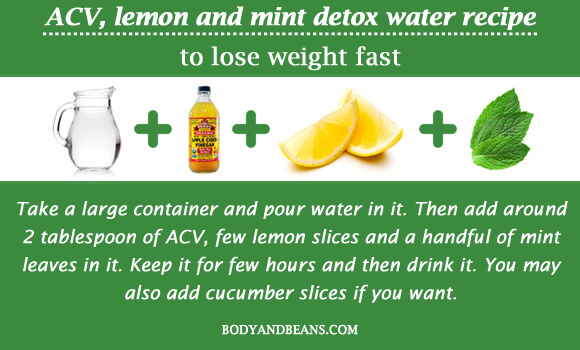 On the other hand, the lemon and the refreshing mint also aid in effective weight loss and hence this combination is just ideal and must definitely be counted as one of the best detox water recipes for fast and effective weight loss. Take a large container and pour water in it. Then add around 2 tablespoon of ACV, few lemon slices and a handful of mint leaves in it. Keep it for few hours and then drink it. You may also add cucumber slices if you want. Lemon is the most powerful ingredient for digestion and weight loss but do you know about the efficiency of aloe vera for weight loss? Well yes, aloe vera is not just for skin but has lot of health benefits as well. The antimicrobial aloe vera contains lot of antioxidants that protects our body from diabetes, cancer and several cardiovascular diseases. It is also a natural energy booster that fights fatigue and helps in better digestion of food. Therefore, when this aloe vera gel is mixed with the lemon slices and potent water, it works wonders for reducing the extra kilos. Extract the aloe gel from the aloe plant and then cut the lemon in small pieces. Take a container full of water and mix the other two ingredients in it. Refrigerate it for few hours before having this healthy drink. If you are someone who suffers from tummy bloat, then you must drink this yummy and healthy tropical quencher. The cucumber is very effective in fighting tummy bloat and reduces any inflammation or swelling. It is packed with various nutrients and antioxidants like potassium that freshen you up after a hectic day. In addition, the pineapples also help in the proper metabolism of human system and the vitamin C content helps to get rid of several diseases. You can also use the refreshing mint that will add to the pleasant aroma as well help you reduce weight. If you drink this healthy drink besides performing regular exercises, you will be able to burn fat fast and get rid of tummy bloat. Take a container and fill water in it. Then add the cucumber and pineapple slices in it. Drop a few mint leaves in it. Keep it for 4-5 hours and then drink it several times a day. I am sure you must have seen celebrities promoting this product to reduce weight. 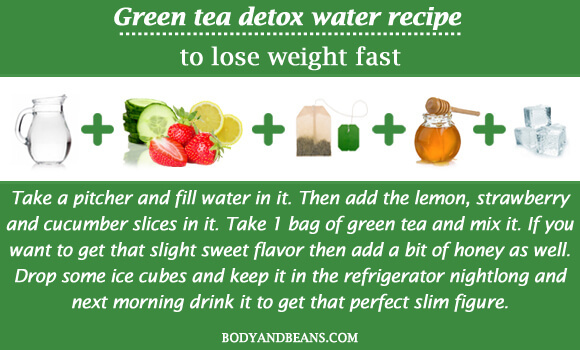 Well yes, green tea is excellent for weight reduction and when mixed with water and other healthy ingredients becomes one of the popular detox water recipes for fast and effective weight loss. Green tea is a detoxifying agent that flushes out the harmful toxins from the human system and maintains body weight. The polyphenols in it keeps your system clean while the other antioxidants aids human body to throw out the free radicals to protect the healthy cells and fight against several health issues. The other healthy ingredients are lemon, strawberry, honey and cucumber, all of which help to burn excess fat and hence can be mixed with green tea for more effective results. Take a pitcher and add water in it. Cut lemon, strawberry and cucumber into small pieces and mix it in the pitcher. Take 1 bag of green tea and mix it. If you want to get that slight sweet flavor then add a bit of honey as well. Drop some ice cubes and keep it in the refrigerator nightlong and next morning drink it to get that perfect slim figure. All these ingredients mixed in this detox water are extremely beneficial for weight loss but what catches out attention here is grapefruit, which is not so popular in the department of weight reduction like that of the lemon and cucumber. Well, in case you are unaware, let me tell you that grapefruit is loaded with enzymes which enable effective burning of body fat. Besides the taste, it revitalizes you and gives you a lot of energy after hectic sessions. In other words, it simply keeps you going throughout the day. The other ingredients lemon, cucumber and mint boosts the digestive system, flushes harmful toxins and cures and soothes any stomach woe or cramps. To make this recipe, first, bring a container full of water and then add the slices of lemon, cucumber and grapefruit in it. 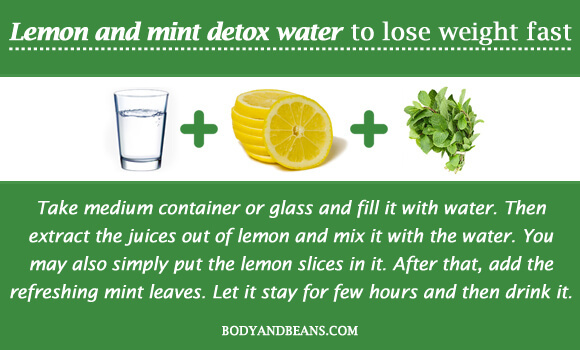 Drop a handful of mint leaves to get that refreshing feel. Refrigerate it if you want or simply keep it for 2 hours before serving on table. Discard it after 24 hours. The hectic lifestyle has made us so much busy that we sometimes are not even aware when our body is exposed to thousands of germs, chemicals and toxins that can make our life a living hell if we do not get rid of them. However, not to worry as there are ways to protect oneself from these toxins with detoxification toping my solutions list. For proper detoxification, a proper hydrated body is required as there can be no other alternate way of natural detoxification of the system. So try some of these detox water recipes and enjoy the benefits. All the above-mentioned detox water recipes to lose weight are tried and tested and found to be very effective. My friends and I have witnessed the benefits and I am sure if you can regularly drink these detox water recipes, you are also bound to slim down. They contain other fruits, vegetables and herbs like lemons, cucumber, mint, aloe vera, green tea etc those when combined with the potent water intensifies the detoxifying process and keeps us free of the harmful germs and toxins. So, the better the metabolic rate, the better will be calorie and fat burn. However, besides these detox water recipes for fast and effective weight loss, please do carry out with your regular exercise and restrict your junk and oily food intake and get that slim and toned body, worth envying. Are you upset over being overweight? 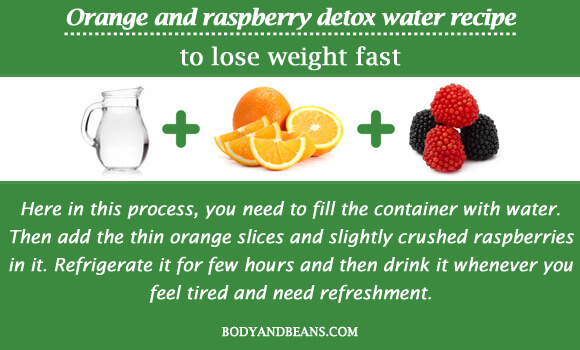 Have you checked out my detox water recipes for fast and effective weight loss? Try out these detox remedies and share me the feedback regarding which one works for you in the comments below. Also, feel free to suggest any other detox water recipe that you feel can benefit my other readers. Until then, stay healthy and safe. Hope to meet with a slimmer you soon.